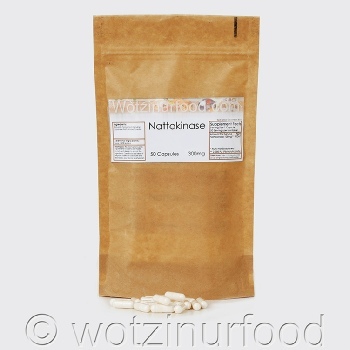 Wotzinurfood Nattokinase capsules are made naturally from rice and contain Genuine Japanese Nattokinase powder with Black Pepper (piperine) to aid absorption. 50 capsules each with 300mg, 6,000 FU’s, size 1. Take 1 - 2 capsules with water on an empty stomach one or two times a day.